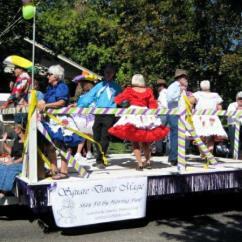 Thank You for helping us with square dancing on Pioneer Day. You made the day really exciting! Without you Pioneer Day would be a disaster! Thank You for being the kind of instructor who makes a difference. We had such a great time at the square dance at our family reunion. Thanks for coming there and for making it so much fum. We just want to say a big Thank You for calling our Beginner's Hoedown and making it a really fun evening for all. It was a great time. Thank You for the excellent job you did in calling our square dance. The youth had a wonderful time and they enjoyed it immensely. It was nice to be able to turn the event over to you and let you take over for a fantastic evening. I was quite surprised with the modern music that you used to keep the kids interested. The mix of square dancing, line dancing, along with the chicken dance made for a wonderful time. You know your craft well, especially with young people. I thought the 250 to 300 people would be a challenge, but you handled it well. You came highly recommended and we were not disappointed. We will use you again when we have an event like this in the future. Thank you for your professionalism and enthusiasm. The Church of Jesus Christ of Latter-day Saints Activities Committee.